What a gorgeous card. LOVE the colors. What a super cute stamp set! That is just a beautiful card. Beautiful card! I love background paper and the paper pieced trees. Beautiful card - perfect for Spring! I love this stamp set! Kim's images are so much fun. I really love this set. These stamps are so cute! And your sample is gorgeous. Oh, cool! Love the spring feel your card has!!! The paper you used for the gorgeous trees just makes me happy!! Love those new stamps!! Kim did it again and your card is truly inspiring! Sooooo way cute my friend!!!! You are amazing!!! I love your card! So beautiful!! I love Kim's stamps. The style is adorable! Thanks for the chance! Wow! I love how you paper priced the trees. So adorable, loves it! I love this stamp set! Thanks for the chance to win! Have a great weekend! Those trees look fabulous paper pieced! Thank you for sharing! This is just adorable...hope I'm lucky today! LOVE THIS! Your card is so HAPPY! Love the paper piecing! Love everything! I like the variations on your BIRDS on the card! What a beautiful card! That paper is perfect for these stamps. Love the colors, it really is spring defined! What a darling card!!! Love it! Oh. My. Goodness. Lea - this card is too cute! 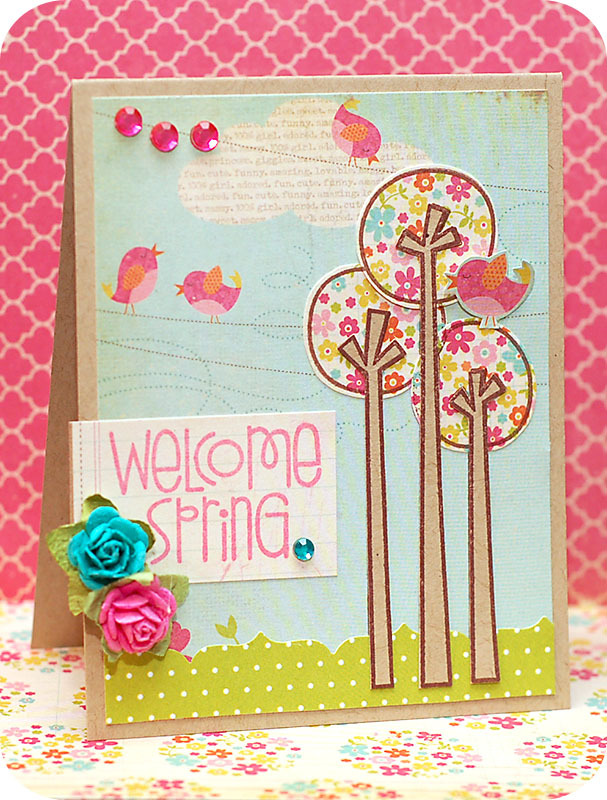 I love all the bright springy colors and those paper pieced trees! Kim definitely picked the right people to showcase this set! Thanks for a chance to win! Love, love, love this card!! I love the color combos. Definitely a great card for a nice Spring day. Ohhhh, I ADORE your little creation Lea! Great card! Love the way you incorporated the swirls and the paper piecing! OMG! This card is darling and what an adorable stamp set!!! I am off to Paper Smooches to check out the other stamps!!! Your card really looks like spring, all the beautiful colours! Oh I love what you've done! So soft and springlike! :> Thanks for the chance to win! You're SO talented! Way to rock the PS stamps! This is gorgeous, Lea! love the patterned papers that you chose! super cute!! Wow. Your cards are darling. Great use of the stamps! I love the color in the trees! LOVE this card! So adorable! Sweetness! What an awesome paper piecing job!! Thanks for the chance to win some lovely Paper Smooches stamps! super cute! Love the paper pieced trees and all the pink! I love your card...the patterned paper is just a perfect choice for the tree tops! Oh, I just love your card, it makes me happy! Thanks for the chance to win! this looks like a cute new set, thanks for a chance to win one! LOVE LOVE LOVE the paper piecing! I think it's my favorite technique! Your card is gorgeous! I'm always looking for different ways to use my punches. I LOVE what you did to make the grass!! Beyond cute! Love the paper piecing on the trees!!! I've also noticed that Kim's stamps stamp cleanly. I just love mine!! Gosh, your card is just gorgeous! It's so fun and sweet! I love these stamps too. Your card is adorable!!! Even love how you photographed it with coordinating papers! Perfect! Thank you so much for the inspiration! Your card is so adorable. TFS and a chance to win. Omg! Your card is adorable! Such a cute stamp set I am ready to place an order. adorable card. Cute stamp set. really love the squirl in the set. Great card Lea! love the pretty trees! I LOVE how you used the tree stamps with the patterned paper! what a perfect touch to your card!! Oh, my my! Tremendous card! Love all of it!! I love this card the birdies are so cute!!! Thanks for the chance to win! This is so cute! I would love to use this to bring a little spring feeling to my mantel! your card is very cute. Thanks for sharing. Fabulous paper-piecing! Love this set! Eeek, I love those patterned paper trees! great color combination and I really like the floral pattern for the trees. Oh my gosh - that card is amazing! i love how you have paper pieced the tree with flower paper!!! Gorgeous card Lea! I love your paper piecing! I do love your spring card. The stamps work beautifully with the pretty paper you chose. Cute set! The stamp set is super cute, and I love the bright colors you used in the card. The swirly dots in the background are lovely! What a great card, I love that you gave the little birds a wire to perch on! Gorgeous! That card just made me so happy! Nice job! I have just fallen in love with Paper Smooches stamps! Your card is so cute with this new set! Love the paper piecing and attention to details! Lea this is so super cute! I love the bright colors you used and those trees are ADORABLE! Love it! 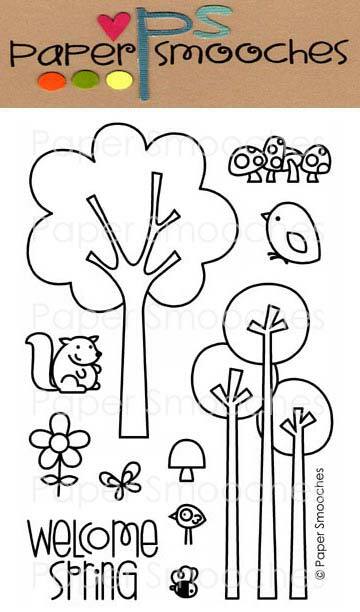 Very fun trees and perfect with the bird paper. Super cute! I love these trees! Thanks so much! Your card is just lovely, nicely done! Gorgeous card! I love the colors and the paper piecing. Thanks for the chance to win. This is adorable!! Love your pretty papers and cute design! Thanks so much for joining us this week at SSiC!! Really beautiful card. Lovely stamp set. Thanks. Your card is so sweet. Kraft+pink+aqua are perfect together! TFS! OMGosh, what a beautiful card! I love your new stamps! A lovely creation, thanks for joining in with our spring theme this week at CCC. What a super sweet card!! Just love those adorable trees!! Wonderful stamp set!! Very clever use of the stamps and pattern papers! Thank you for sharing at PCJ this fortnight! Oh Lea, everything you do is just perfect! I love the bright colors on this one! So sweet! love the little birdie perched in the tree. Great new stamps! Thank so much for joining us at The Kraft Journal Lea! Spring is my favorite season! You have made a beautiful card with this cute stamp set! Love the colours also! Love the paper pieced trees, this card is so cheery and happy! Would love to welcome spring with this wonderful set of stamps. Gorgeous sweetie. Thank you so much for joining us at Creative Card Crew this time and good luck. I like how you made the trees - stamping them on patterned paper! Love those happy little trees. Adorable card! Love the spring patterns! Love the wat you paper pieced those adorable trees! Wonderful card and gorgeous set! Love it! Saw that you were chosen today at Cupcake Crafts. Your card was my favorite too! Great job!